London: Egoist Press,, 1916. Octavo. Original green cloth, recased with original spine laid down, titles in blind to front board and to spine gilt. Housed in a custom green cloth slipcase. A little wear to top edge of rear cover, hinges repaired, short closed tear to head of pp. 117-20. A very good copy. First edition, English issue from American sheets. A rare presentation copy with the exceptionally early authorial inscription to the front free endpaper, "To Edmund Brauchbar James Joyce Zurich, Switzerland, 12/iii/917". A superb association: Edmund Brauchbar formed a long-lasting friendship with Joyce and has been proposed as a partial model for Leopold Bloom. He was one of a number of assimilated Jews who became Joyce's patrons in Zurich by taking English lessons with him, and from whom in turn Joyce sought information about Judaism. In 1939 Joyce tried to get Brauchbar's cousin out of Nazi Europe into America, and there is evidence to suggest that the publisher Benjamin Huebsch, Brauchbar, and Joyce were all involved in a kind of underground operation to help several Jews escape to America, Ireland, and Australia. When in 1940 Joyce and his family were allowed entry to neutral Switzerland, part of the exorbitant financial guarantee demanded was deposited on his behalf by Brauchbar. Joyce's first novel was published in America by Huebsch from whom Harriet Shaw Weaver, the proprietor of the Egoist Press, purchased "not more than 750" sets of sheets, issuing them here a year before her own UK printing of 1917. From the library of writer, editor, and Joyce collector Alexander Neubauer, with his bookplate to the inside of the folding case. , , . 10 piccoli fogli sciolti (cm 7,5x11 c.ca) con disegni originali a china e matita al recto e racconti autografi al verso dell'artista Jessie Boswell. I disegni, numerati con numeri romani, sono spesso accompagnati da battute dei vari personaggi ritratti o didascalie. I testi autografi al verso sono ugualmente scritti a china in calligrafia molto minuta in lingua inglese. La tavola I è datata 27 luglio 1916. Solo l'ottava tavola è realizzata su quartino che riporta alla prima facciata un disegno e sulle due facciate interne un testo e un altro disegno a matita. 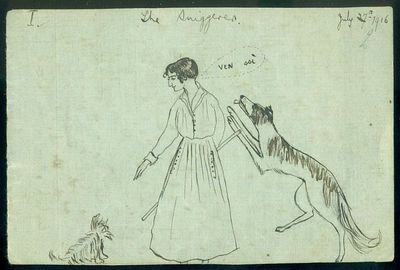 Alcuni dei disegni di "The Sniggerers" sono pubblicati su "Jessie Boswell", catalogo della mostra a cura di Ivana Mulatero (Bolaffi, 2009). . . . "Il 27 luglio 1916 inizia il racconto The Sniggerers (Risolini maliziosi) su piccoli fogli, con i primi ritratti di Cesarina e i suoi autoritratti con i capelli raccolti di profilo e l'abito lungo da casa, la divisa blu, e altri personaggi, come il pittore che dipinge e mostra a Cesarina un quadro (Micheletti in quell'anno ritrae Lily e Renato), i genitori di Cesarina, il Maestro, Mister Heiman, il Generale, Luigina. Dei disegni realizzati a penna, otto sono attribuibili a Jessie e gli ultimi due, a matita, a Cesarina, che a sua volta si ritrae con Jessie e il fratello Ermanno, uno è di Edmea. Nel dicembre 1939, Jessie invia a Cesarina alcuni di questi piccoli foglietti e il 20 marzo 1940, mentre commenta alcune pitture di Cesarina le scrive: "Ho trovato altre pagine del volumetto di caricature "I Sniggerers" con un tuo capolavoro. Riderai. Non mi ricordo dove abbiamo visto Ermanno in vettura quella volta." (testo di Beatrice Marconi su "Jessie Boswell", catalogo della mostra a cura di Ivana Mulatero (Bolaffi, 2009). 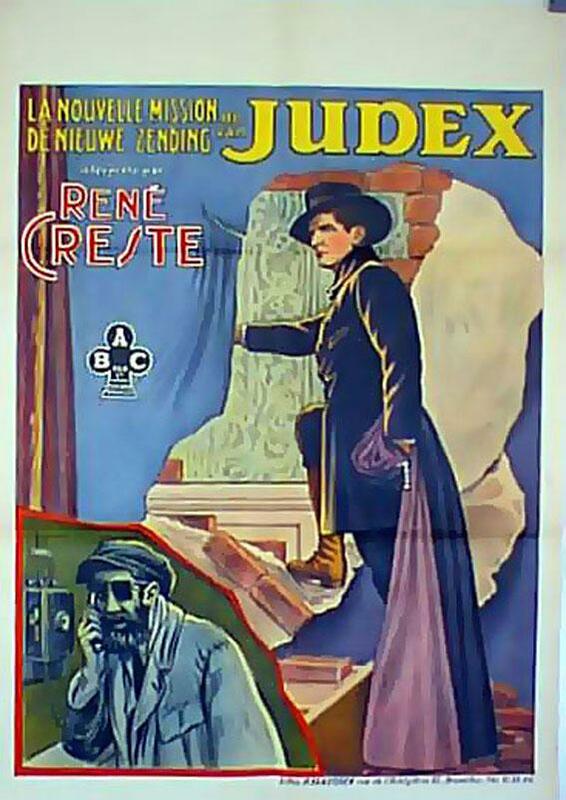 GAUMONT 1916 - JUDEX - 1916, Dir: LOUIS FEUILLADE, Cast: RENE CRESTE, MUSIDORA, REYE POYEN, , , Nac. film: FRANCIA, Company: GAUMONT, Designer: , , Nac. 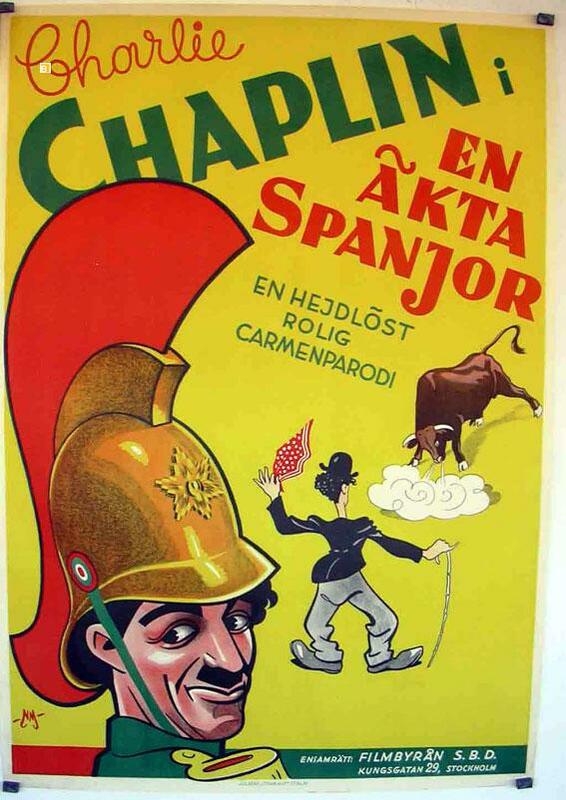 poster: BELGICA, Measures (Cm. and Inches) : 80X60-CM.-24X32-IN., Type of product: POSTER, , POSTER are in excellent condition but may have normal wear such as edge wear or a slight hole. I try photograph any flaw but examining the photos closely is your best bet! Please see bigger picture for details., , La mayoría están en excelentes condiciones, pero puede tener desgaste del borde o algun agujero pequeño. Intento fotografiar cualquier defecto, pero el examen de las fotos de cerca es su mejor opción! Por favor ver la foto en grande para más detalles., , SHIPPING COSTS: Fold posters SPAIN 15? -Correo certificado EUROPE and all world 20? New York: Henry Holt, 1916 Original black cloth. Very good. Cloth case. FIRST EDITION. 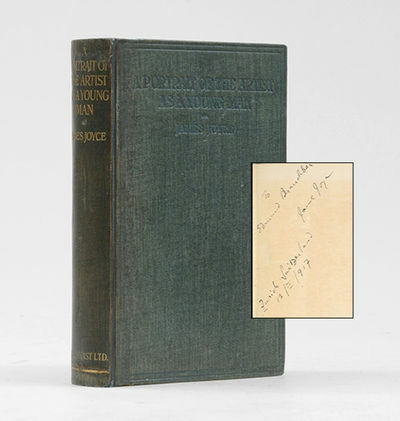 Presentation copy inscribed by Sandburg: "Anna Proctor - fellow Scandinavian - here is 'skoal' - Carl Sandburg Detroit, April, 1922." 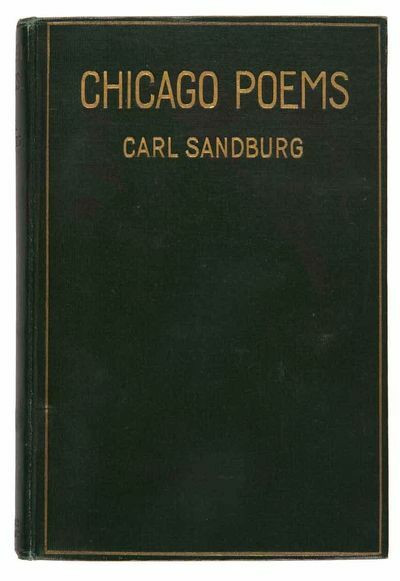 Chicago Poems is Sandburg's best book of poetry and his first published book, preceded only by privately printed works. The volume includes his most famous verse including "Chicago" ("Hog Butcher for the World ... City of the Big Shoulders") and "Fog" ("The fog comes on little cat feet"). [with:] SANDBURG, CARL. "Fog" Autograph Manuscript. No place, no date. 5 ½ x 8 ½ in. Slight staining at edges, ink number at foot of leaf, neither approaching the manuscript. This is the complete text of Sandburg's beloved and much-anthologized poem "Fog," beginning "The fog comes on little cat feet ..." Harriet Monroe, the editor of Poetry, wrote "I remember the emotion with which I first read many of these poems ... That first conviction and power returns to me as I read them again. This is speech torn out of the heart, because the loveliness of ... a fog coming 'on little cat feet,'--the incommunicable loveliness of the earth, of life--is too keen to be borne." Provenance: Mrs. Charles Engelhard, Christie's New York, 27 October 1995, lot 121. Needham, MA: Rosemary Press, 1916. (iii), 101, (2)ff. From an edition of 75 copies printed for the 129th meeting of the American Oriental Society, this is one of fifteen reserved for the Press. A charming miniature book featuring Khayyam's celebrated couplets on the recto of each page. 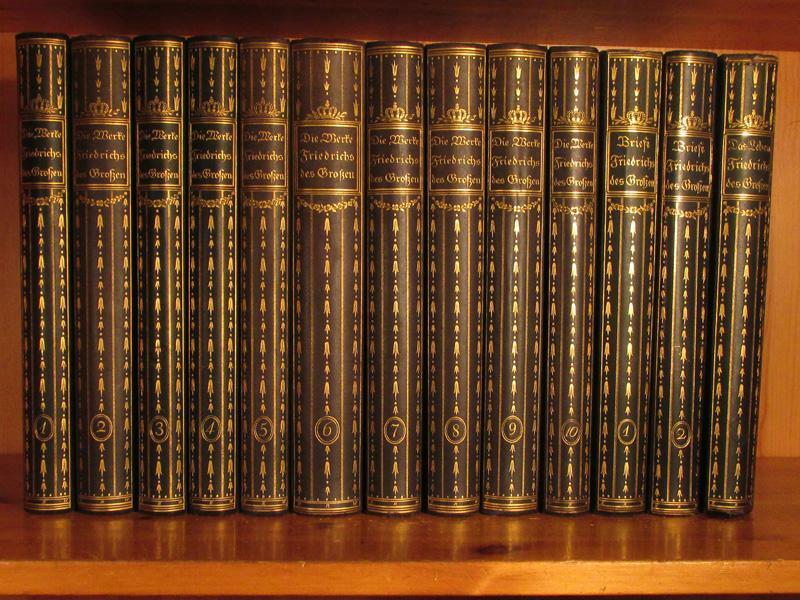 The edition was privately issued for the American Oriental Society, one of the nation's oldest learned societies and the oldest devoted to a particular scholastic discipline. George W. and Winthrop M. Southworth, proprietors of the Rosemary Press, were members of the Omar Khayyam Club of America, and they issued at least eight small editions of the Rubaiyat between 1916 and 1921 for various clubs and societies. All were specially bound, though only a few had a jewel on the cover. 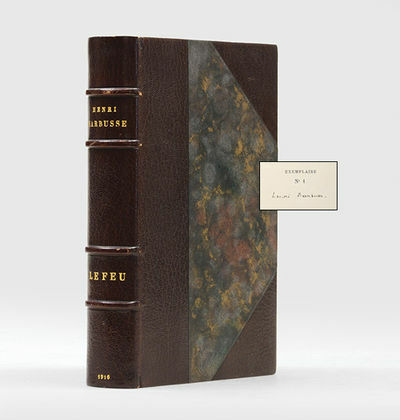 This copy is bound oblong in yellow leather with gilt stamping and cabochon-cut piece of jade inset on the upper cover. 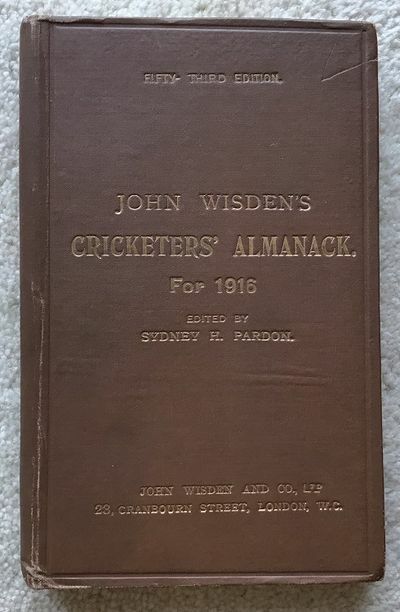 A fine copy of a select edition. (Bromer/Edison, p. 60; Bradbury, p. 247). (1 by 2 7/8; 25x71mm). New York. David McConnell. Ca. 1916. Catalog 10 ½ x 15 ¾ inches, 42 glossy pages of high quality illustrations in a thin green cloth-cover board binder secured with screw fasteners. Laid in is a folded brochure 8 ½ x 3 ¾ inches listing prices "effective January 1, 1923"; however, it is likely that the catalog featuring the company's product line was produced in the teens and was intended for use by the company's contracted regional female sales personnel over the years. OCLC/WorldCat shows only two library holdings; Hagley Museum and Library in Delaware lists two copies (1923 and 1926) and the University of California at Berkeley lists a copy with date of 1920s. There is also one reproduction copy listed. An uncommon catalog in excellent clean condition. The catalog features a magnificent range of products and superb color printing. Pages are separated by thin paper sheets featuring information regarding the products pictured, in magnificent color detail, on the page prior and the page that follows. Many of these sheets have revisionist information (pen or pencil strike-through of printed prices with "corrected" quotes - usually "up"). 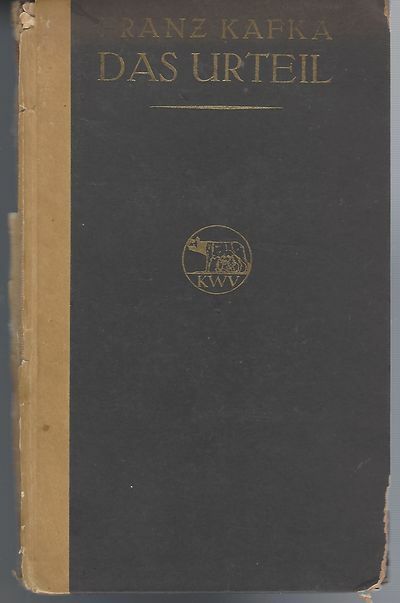 Text on the title page reads "Color plate catalog of perfumes, toilet waters, sachet powders, complexion creams, talcum powders, toilet preparations, soaps and soap preparation..." followed by a list of 12 additional products offered by the firm. Two sides of a medallion are pictured on the interior of the front cover with text below stating: "Gold Metal Award, Panama-Pacific Exposition, 1915." A brief history of the company can be found at http://www.californiaperfumecompany.com/products/cal_catalogs_1.html. The site provides a history of the firm (which eventually became Avon) and its founder, David McConnell. An uncommon catalog in exceptional condition. Dahl Playfully Writes To A Maine Elementary School Class: "If Any Of You Children Want To Apply For The [Secretary] Job, Please Do So But You Will Have To Be Very Good At Shorthand And Typing And Driving A Car And Sometimes Looking After Three Dogs..."
ROALD DAHL (1916-1990). Dahl was a beloved children's author best remembered for James And The Giant Peach and Charlie And The Chocolate Factory. TLS. 1pg. 8 ½" x 10 ¼". September 28, 1978. Gipsy House. 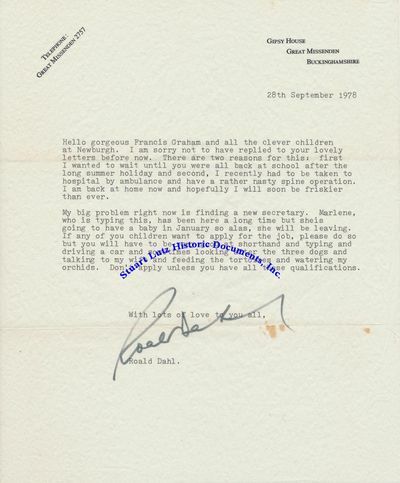 A typed letter signed "Roald Dahl" on his personal letterhead. He wrote to "Mrs. Francis Graham's Class" in Maine after they wrote to the author: "Hello gorgeous Francis Graham and all the clever children at Newburgh. I am sorry not to have replied to your lovely letters before now. There are two reasons for this: first I wanted to wait until you were all back at school after the long summer holiday and second, I recently had to be taken to the hospital by ambulance and have a rather nasty spine operation. I am back home now and hopefully I will soon be friskier than ever. My big problem right now is finding a new secretary. Marlene, who is typing this, has been here a long time but she is going to have a baby in January so alas, she will be leaving. If any of you children want to apply for the job, please do so but you will have to be very good at shorthand and typing and driving a car and sometimes looking after three dogs and talking to my wife and feeding the tortoises and watering my orchids. Don't apply unless you have all these qualifications." The letter has two mailing folds, including a faint one through the large signature, and a couple browning spots that affect nothing. The original mailing envelope is included. A fine and playful Dahl missive. 1916. København, Gyldendal, 1916. 8vo. 45 s. 1 originalradering etter Edvard Munch. Fint håndb. skinnbd. av Rigmor Birkedal Krag. Orig. omsl. medbundet. Ubesk.. . Nr. 132 av 350 numm. eks. Gerd Woll s. 476. Valencia: Prometeo, 1916. First Edition. Wrappers. Good. 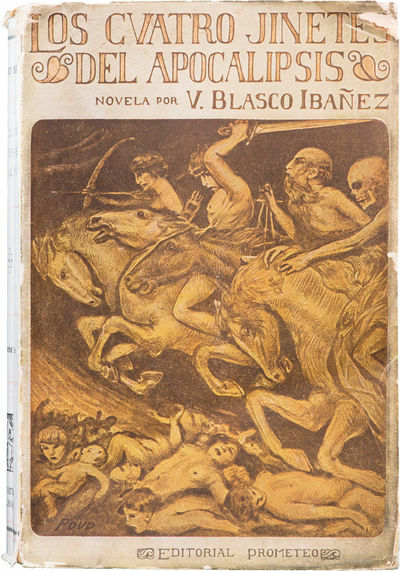 1st edition (Valencia, 6,000), 396pp, in Spanish). Original printed wrappers chips, toning and wear to the extremities, else very good (also issued in cloth with no known priority). Paris is the setting, and WWI is the time, for this novel contrasting events that engulf 2 families divided by the conflict. It was a huge success world wide (200 editions in almost every language), a 1919 American edition was the Publishers Weekly number 1 bestseller for that year. Films were made and released in 1921 (Valentino) and in 1962 (reset in the '40s). We sold a copy 8 years ago with 8,000 on the title page (our catalog 42). This one's earlier with 6,000 on the title page. My quickie census of copies held by Institutions could not find one with a number lower than 10,000, including copies in wrappers or even rebound ones. That doesn't mean they're not out there. It just may mean they are not findable by me. W.G. Henshaw / Volcan Land & Water Co.. 1916.. 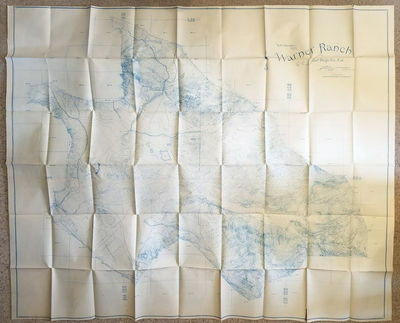 Huge blue line map, approximately 64 x 72 1/2 inches, folding to approximately 10 1/2 x 8 inches. Small separations at several folds, overall very good condition. In the book "Building the Ultimate Dam: John S. Eastwood and the Control of Water in the West" the author Donald C. Jackson provides background on this early 20th century period of the development of the Warner Ranch property, development intricately tied to with the history of water rights in Southern California and the displacement of the Native American Indians of the area: "In 1911, (Ed) Fletcher became associated with William G. Henshaw, a San Francisco-based businessman who owned the Riverside Cement Company and who had recently purchased the Warner Ranch at the headwaters of the San Luis Rey River. Development of the Lake Henshaw project (as it later came to be known) had begun in 1905, when Fletcher served as an agent for Henry Huntington's South Coast Land Company. When Huntington abandoned his own plans for this scheme, Fletcher arranged for Henshaw to buy Warner Ranch; in turn, Fletcher assumed management of the newly formed Volcan Land and Water Company to develop water rights along the San Luis Rey River that were tied to the ranch. The Lake Henshaw project proved more complicated than originally envisaged and remained incomplete for more than a decade. In 1914, however, Fletcher and Henshaw approached Eastwood for a dam design. This initiative foundered, but it was soon followed by plans for another multiple arch dam along the nearby San Dieguito River." In 1900 a U.S. Supreme Court ruling had authorised "the eviction of the Cupa people from their ancestral homeland at Warner Springs, leading to a forced removal two years later. May 27, 1902 Congress appropriates $100,000 to purchase land in Southern California for Mission Indians and to relocate them to the new land holdings. 1903 The Cupenos are forcibly transported to the Pala reservation by Indian agents in a three-day "Trail of Tears" and settled among the distinctly different LuiseÃ±o people with whom they eventually become integrated." (San Diego University website: Chronology of the Indigenous Peoples of San Diego County). This huge map "Surveyed and Mapped July 1916 by the Volcan Land & Water Co." provides a detailed view of the topography and rivers of the Warner Ranch land. No record of this map is found in WorldCat, but a smaller map related through its connection with the Volcan Land & Water Co. is a "Map of San Luis Rey Valley in vicinity of Foss Lake and San Luis Rey Mission : showing ground water contours" (OCLC Number: 28449808). An uncommon map from a significant moment in the struggle for and development of water rights in Southern California and the removal of the Native Americans who had long inhabited the region. .
London: Privately Printed. London, Privately Printed, 1916. Limited Edition. Hardback. An uncommon limited edition containing enlarged facsimiles of Holbein's famous woodcut designs executed by Hans Lutzelburger. A very good copy with a little grubbiness and toning, but overall a pleasing copy. Heavily illustrated by Holbein. One of just 250 privately printed copies. Bookseller's stamp to front pastedown. [6455, Hyraxia Books]. . Very Good. Hardback. Limited Edition. 1916. London: Grant Richards Ltd,, 1916. With two drawings by Albert Rutherston (Rothenstein). Octavo. 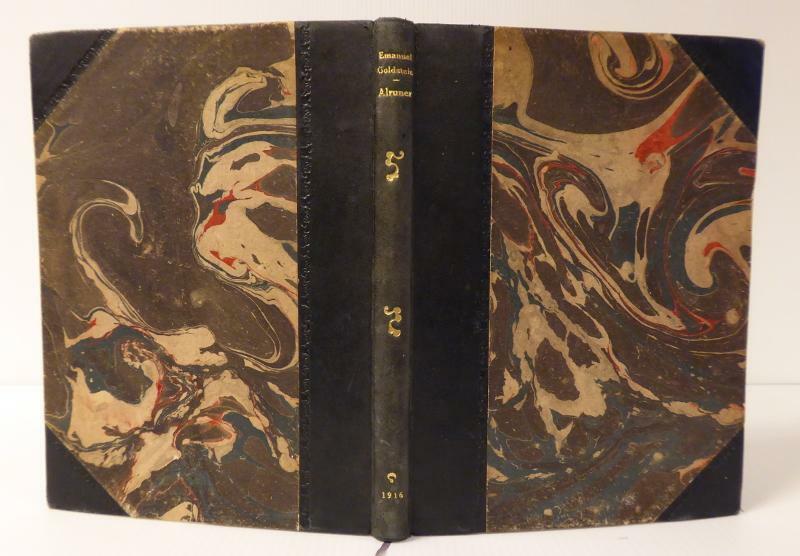 Original black cloth, spine and front cover lettered in gilt, top edge green. With the dust jacket. Spine ends creased, light bumping to board edges, foxing to prelims and edges of text block. A very good copy in the toned jacket, loss to head of spine, short closed tears to panels, 50 mm closed tear to top tip of front flap. First edition, first impression, of Firbanks's second novel, one of 500 copies only printed. This copy is without the publisher's catalogue, which, as Benkovitz notes, has no bearing on priority. New York: B. W. Huebsch, 1916. First Edition. Original Cloth. Near Fine+. First American Edition of the title "universally considered by dealers and collectors alike Mr. Lawrence's scarcest book." (MacDonald) 8vo: ,467,pp. 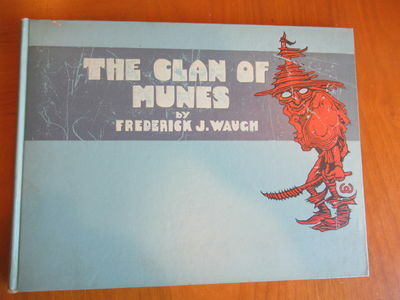 Publisher's original dark tan coarsely woven cloth, upper cover and spine lettered in black; lacking the scarce dust jacket. Near Fine or better (dust-soiled and spotted top edge, a touch shelf-worn). 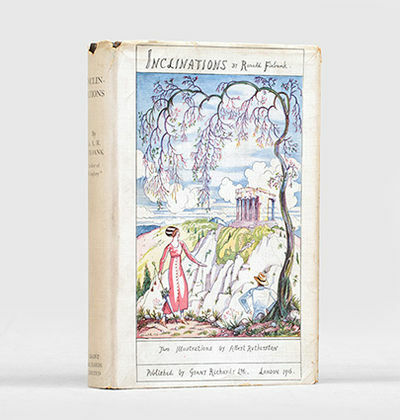 Neither Roberts nor MacDonald gives a separate entry for the New York edition, but both note its appearance under the entry for the London edition.) Roberts A7. MacDonald 7. ML 100, 48. The Observer's 100. Although the title page bears the date 1916, this edition was first published November 30, 1915, in order to establish the legitimacy of the American copyright date. 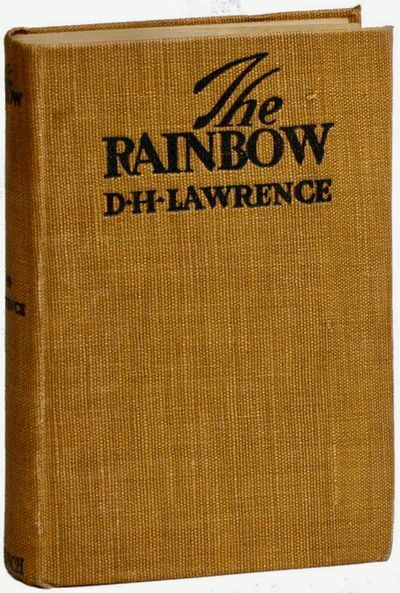 "The Rainbow and Women in Love were originally intended to form one novel entitled The Sisters, which was begun in 1913 when Lawrence was living in Italy, but as the novel developed across 1913-14-whilst Lawrence and [his wife] Frieda moved from Italy to Germany to England and back to Italy again-its scope grew so much that in the autumn of 1914 Lawrence decided to create two novels. The Rainbow . . . is one of his major achievements, radical in both form and content." (Literary Encyclopedia) "Pronounced obscene when it was first published in 1915, The Rainbow is the epic story of three generations of the Brangwens, a Midlands family. A visionary novel, considered to be one of Lawrence's finest, it explores the complex sexual and psychological relationships between men and women in an increasingly industrialized world." (ML 100) N. B. With few exceptions (always identified), we only stock books in exceptional condition, carefully preserved in archival, removable polypropylene sleeves. All orders are packaged with care and posted promptly. Satisfaction guaranteed. (Fine Editions Ltd is a member of the Independent Online Booksellers Association, and we subscribe to its codes of ethics.). W.G. Henshaw / Volcan Land & Water Co. 1916. Huge blue line map, approximately 64 x 72 1/2 inches, folding to approximately 10 1/2 x 8 inches. Small separations at several folds, overall very good condition. In the book "Building the Ultimate Dam: John S. Eastwood and the Control of Water in the West" the author Donald C. Jackson provides background on this early 20th century period of the development of the Warner Ranch property, development intricately tied to with the history of water rights in Southern California and the displacement of the Native American Indians of the area: "In 1911, (Ed) Fletcher became associated with William G. Henshaw, a San Francisco-based businessman who owned the Riverside Cement Company and who had recently purchased the Warner Ranch at the headwaters of the San Luis Rey River. Development of the Lake Henshaw project (as it later came to be known) had begun in 1905, when Fletcher served as an agent for Henry Huntington's South Coast Land Company. When Huntington abandoned his own plans for this scheme, Fletcher arranged for Henshaw to buy Warner Ranch; in turn, Fletcher assumed management of the newly formed Volcan Land and Water Company to develop water rights along the San Luis Rey River that were tied to the ranch. The Lake Henshaw project proved more complicated than originally envisaged and remained incomplete for more than a decade. In 1914, however, Fletcher and Henshaw approached Eastwood for a dam design. This initiative foundered, but it was soon followed by plans for another multiple arch dam along the nearby San Dieguito River." In 1900 a U.S. Supreme Court ruling had authorised "the eviction of the Cupa people from their ancestral homeland at Warner Springs, leading to a forced removal two years later. May 27, 1902 Congress appropriates $100,000 to purchase land in Southern California for Mission Indians and to relocate them to the new land holdings. 1903 The Cupenos are forcibly transported to the Pala reservation by Indian agents in a three-day "Trail of Tears" and settled among the distinctly different Luiseño people with whom they eventually become integrated." (San Diego University website: Chronology of the Indigenous Peoples of San Diego County). This huge map "Surveyed and Mapped July 1916 by the Volcan Land & Water Co." provides a detailed view of the topography and rivers of the Warner Ranch land. No record of this map is found in WorldCat, but a smaller map related through its connection with the Volcan Land & Water Co. is a "Map of San Luis Rey Valley in vicinity of Foss Lake and San Luis Rey Mission : showing ground water contours" (OCLC Number: 28449808). An uncommon map from a significant moment in the struggle for and development of water rights in Southern California and the removal of the Native Americans who had long inhabited the region. Boston: Small, Maynard and Company,, 1916. and the Year Book of the American Short Story. Octavo. Original blue cloth, spine and front cover lettered in gilt, single rule in blind to front cover, silk page marker, top edge gilt. Spine ends slightly creased, extremities rubbed, otherwise an excellent copy. 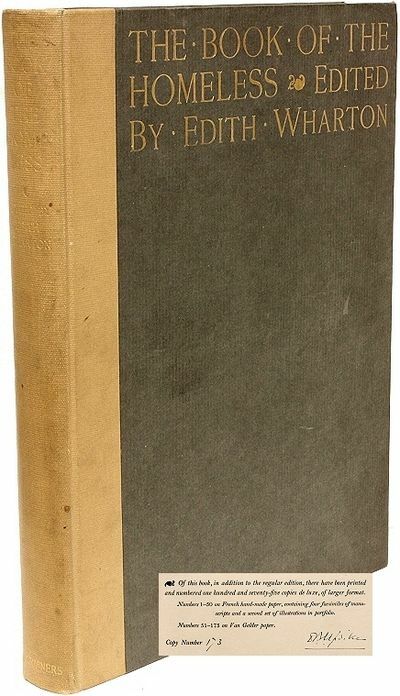 First edition, first printing, inscribed by the editor on the front free endpaper, "For Joseph W. Jennings, with the best wishes of Edward J. O'Brien, April, 1916". 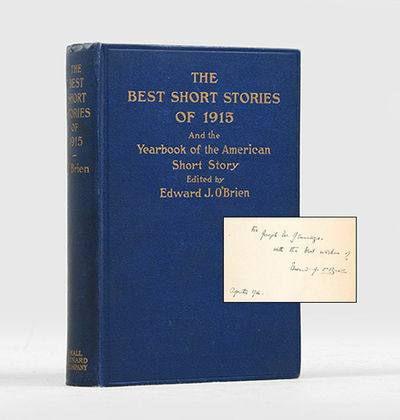 The first volume of O'Brien's The Best Short Stories Series, which ran from 1915 to 1926, this work includes notable short stories from previous years in addition to those published in 1915, such as Joseph Conrad's "Laughing Anne" and "The Planter of Malta". 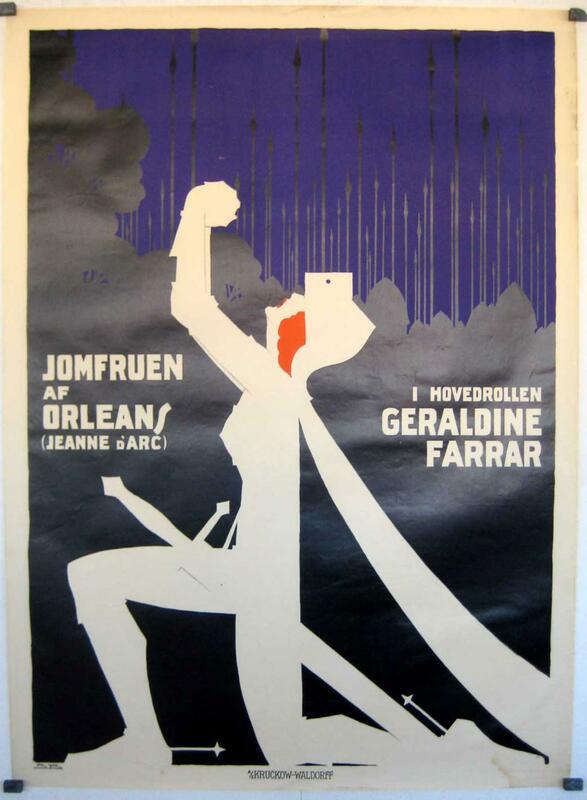 CARDINAL FILM 1916 - JOMFRUEN AF ORLEANS - 1916, Dir: CECIL B. DEMILLE, Cast: GERALDINE FARRAR, RAYMOND HATTON, HOBART BOSWORTH, , , Nac. film: USA, Company: CARDINAL FILM, Designer: BRASCH, , Nac. poster: DINAMARCA, Measures (Cm. and Inches) : 59X82 CM 23X32 IN, Type of product: POSTER, , POSTER are in excellent condition but may have normal wear such as edge wear or a slight hole. I try photograph any flaw but examining the photos closely is your best bet! Please see bigger picture for details., , La mayoría están en excelentes condiciones, pero puede tener desgaste del borde o algun agujero pequeño. Intento fotografiar cualquier defecto, pero el examen de las fotos de cerca es su mejor opción! Por favor ver la foto en grande para más detalles., , SHIPPING COSTS: Fold posters SPAIN 15? -Correo certificado EUROPE and all world 20? 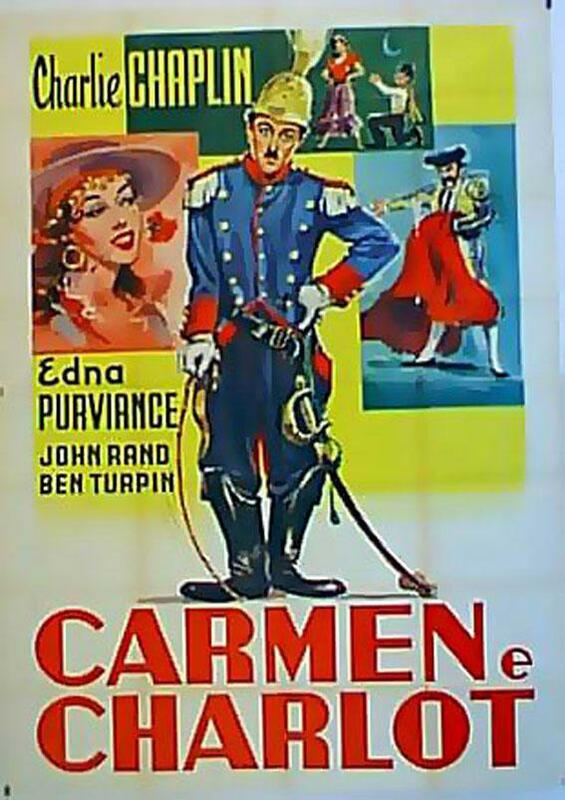 A.M. 1916 - CARMEN E CHARLOT - 1916, Dir: CHARLES CHAPLIN, Cast: CHARLES CHAPLIN, MAY WHITE, EDNA PURVIANCE, WESLEY RUGGLES, BEN TURPIN, , , Nac. film: USA, Company: A.M., Designer: , , Nac. poster: ITALIA, Measures (Cm. and Inches) : -100X140-Cm.-40X55-INCHES-2 SH., , Type of product: POSTER 2 SH, , POSTER 2 SH are in excellent condition but may have normal wear such as edge wear or a slight hole. I try photograph any flaw but examining the photos closely is your best bet! Please see bigger picture for details., , La mayoría están en excelentes condiciones, pero puede tener desgaste del borde o algun agujero pequeño. Intento fotografiar cualquier defecto, pero el examen de las fotos de cerca es su mejor opción! Por favor ver la foto en grande para más detalles., , SHIPPING COSTS: Fold posters SPAIN 15? -Correo certificado EUROPE and all world 20? Native Life in Africa, Before and Since the European War and the Boer Rebellion. London, P. S. King and Son, . 8vo. Original terracotta pebble-grained cloth, letttered in black; pp. 352, portrait of the author, portrait of his wife; minimal marking to binding, initially and at the end a little spotted, otherwise a good copy. Very rare first edition of a milestone of the Native African Rights movement in South Africa. Solomon Tshekisho Plaatje (1876-1932) was a teacher, court interpreter and clerk to the Mafeking administrator of Native Affairs, author, journalist, linguist (he translated Shakespeare into Tswama), political activist and first Secretary-General of the SANNC (South African Native National Congress), which later became the ANC. He was only very slowly rediscovered from the 1970s onwards; in 2014 Jacob Zuma named the University at Kimberley Sol Plaatje University. COPAC lists only later editions of this title. Valencia: Prometeo, 1916. First Edition. 1st edition (Valencia, 6,000), 396pp, in Spanish). Original printed wrappers chips, toning and wear to the extremities, else very good (also issued in cloth with no known priority). Paris is the setting, and WWI is the time, for this novel contrasting events that engulf 2 families divided by the conflict. It was a huge success world wide (200 editions in almost every language), a 1919 American edition was the Publishers Weekly number 1 bestseller for that year. Films were made and released in 1921 (Valentino) and in 1962 (reset in the '40s). We sold a copy 8 years ago with 8,000 on the title page (our catalog 42). This one's earlier with 6,000 on the title page. My quickie census of copies held by Institutions could not find one with a number lower than 10,000, including copies in wrappers or even rebound ones. That doesn't mean they're not out there. It just may mean they are not findable by me. Good. Der Golem. Prager Phantasien. Lithographien zu Gustav Meyrinks Roman von Hugo Steiner-Prag, Kurt Wolff Verlag/Leipzig, 1916, Erstausgabe, Folio/51 x 37 cm illustrierte Orig.Halbpergamentmappe No. 16 von 265 numerierten Exemplaren, im Impressum vom Künstler signiert, ebenso die Titelseite signiert. Enthält ein Doppelblatt mit Titel, Impressum und Inhaltsverzeichnis sowie 25 Lithographien unter Passepartout. Jedes Passepartout mit Nummer und Wasserzeichen des Kurt Wolff Verlages. Sehr schönes Exemplar, Einband mit einigen kleineren Flecken. NY: Charles Scribner's Sons, 1916, 1916. FIRST LIMITED NUMBERED EDITION. 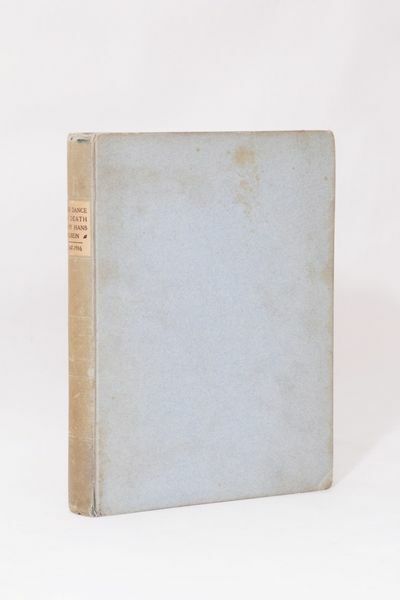 1 vol., 4to., illustrated, copy #173 of 175 numbered large-paper copies printed on Van Gelder paper, signed by D.B. Updike of The Merrymount Press. Bound in the publisher's original tan cloth backed gray paper boards, no ownership signature, inscription, or bookplate of any kind, inner and outer hinges fine, head and foot of spine fine, back corners square, overall a VERY GOOD+ sharp copy. Maleri. Sign. Axel Johansen 1916. Lysmål 37,5x47 cm. Indrammet i guldramme. Leipzig: Kurt Wolff. Good+. 1916. First. Hardback. Blk boards, somewhat worn; small losses to front and rear front edges; gilt titling and decoration, still quite bright. Parchment spine, very worn - backstrip disintegrated, stitched binding exposed. Binding very frail, but intact. German text. ; 8vo (5" x 8"); 28 pages . London: The Poetry Bookshop,, 1916. Octavo. Original wrappers, hand-coloured woodcut illustration by Claude Lovat Fraser to front wrapper, titles in black, adverts on inner wrappers. Tanning to spine, small chip to tail, edges a little creased, some ink flecks to upper outer corner of front wrapper, foxed within, still a very good copy. 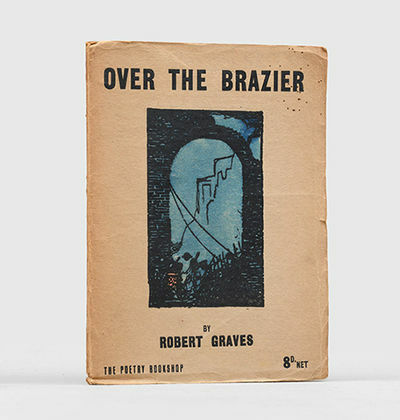 First edition, first impression, of Graves's first book, published when he was serving as a subaltern in the Royal Welsh Fusiliers during the First World War, shortly after his first meeting with fellow poet and Fusilier Siegfried Sassoon. This first impression was published on 1 May 1916. There was a second impression in 1917, and a second edition in 1920. Very scarce in such nice condition. Le Feu. (Journal d'une Escouade). with a story to tell and re-tell", and the novel was awarded the Prix Goncourt for 1916. This copy has the bookplates of subsequent bibliophiles: Jules Exbayrat, president of 'Les Bibliophiles Franco-Suisses', and Venezuelan novelist José Fabbiani Ruiz. [Den Haag], "Per le nozze" [= eigen beheer, 1916]. 22,4 x 16,1 cm. Origineel licht gewolkt beige karton. (4), 28 p. Niet afgesneden. Gezet [naar aanwijzingen van J. van Krimpen] en gedrukt [bij Mouton & Co.] op Hollandsch papier van Van Gelder en Zonen in een oplage van 50 ongenummerde exemplaren. 1e druk. Rug beschadigd en incompleet, hoeken gedeukt. Uit de bibliotheek van M. en A.H. Nijhoff. In handschrift van de auteur, onder het laatste vers, op p. 22: 'Alzoo mijn kind, laat ons vroolijk/ spelen/ G.' verbeterd in: 'Alzo mijn bruid, laat ons vroolijk spelen/ G.'. New York: Henry Holt and Company, 1916. Cloth. Near Fine. 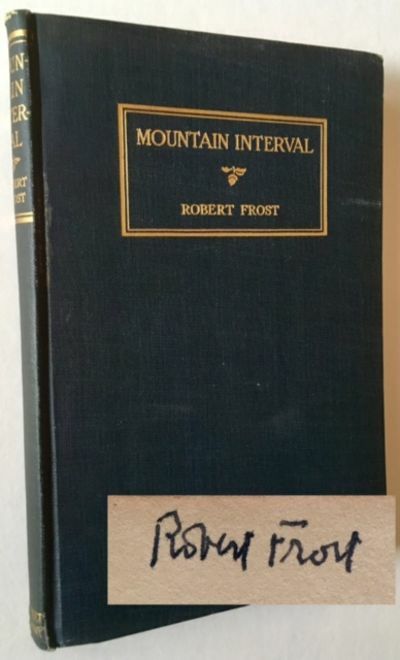 SIGNED BY ROBERT FROST IN A STRONG BLUE INK on the half-title page. A very solid copy to boot of the November 1916 1st issue of the 1st edition (with the repeated lines on pg. 88 and with 'Come' for 'Gone' on pg. 93, line 16). 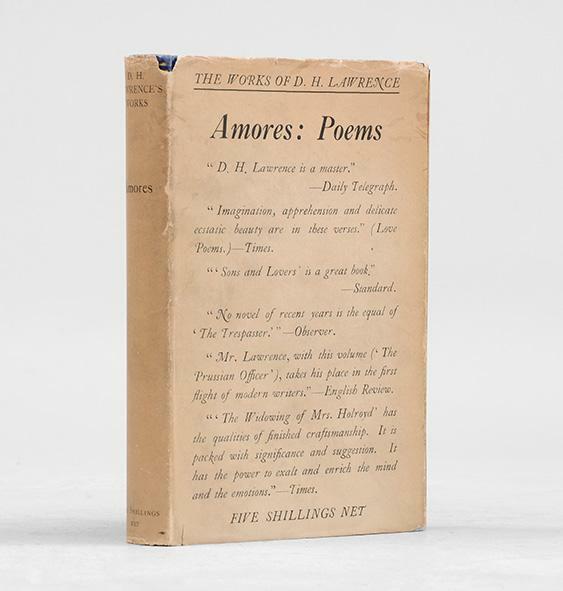 Solid and Near Fine in its navy-blue cloth, with crisp, unflecked gilt-titling and bordering along the front panel and spine. Just a touch of very light wear at the spine base (with miniscule bumping) and one tiny, barely-detectable bump at the front panel's upper tip. Internally, clean as could be, with no writing of any kind. 12mo, the poet's celebrated 3rd published collection --and first to be published originally in the United States. Die Werke Friedrichs des Großen. In deutscher Übersetzung. Mit Illustrationen von Adolph von Menzel, 10 + 3 Bände, Ganzleinen-Ausgabe. Berlin, Verlag von Reimar Hobbing, 1912 - 1916. - Vollständiges Werk in 10 Bänden sowie Briefe Friedrichs des Großen 2 Bände) sowie die Biographie von Max Hein: Friedrich der Große. Ein Bild seines Lebens (2. Aufl., 1916), insgesamt somit 13 Bände. Königsblaue Original-Ganzleinenbände im Großformat 29 x 21 cm mit goldgeprägtem Rückentitel, Kronensymbol sowie reichen floralen und ornamentalen Goldprägungen, Vorderdeckel mit goldener Medaillonprägung; illustrierte Vorsätze in floralem Design. Opulent ausgestatte und reich illustrierte Werkausgabe Friedrichs. Im Gesamtumfang von ca. 3.000 Seiten. Alle Bände mit zahlreichen ganzseitigen Illustrationstafeln in Kupfertiefdruck Adolph von Menzels. Bd. I: Denkwürdigkeiten zur Geschichte des Hauses Brandenburg, XV, 244 S., 2 Bl. Bd. II: Geschichte meiner Zeit, VIII, 277 S., 2 Bl. Bd. III: Geschichte des Siebenjährigen Krieges. Erster Teil, VII 238 S., 3 Bl. Bd. IV: Geschichte des Siebenjährigen Krieges. Zweiter Teil, VII 209 S., 2 Bl. sowie 18 ganzseitige farbige Schlachtenskizzen und 2 ausfaltbare Übersichtsskizzen über den Kriegsschauplatz. Bd. V: Altersgeschichte. Staats- und Flugschriften, VII, 248 S., 2 Bl. sowie 3 ausfaltbare farbige Kartenskizzen. Bd. VI: Militärische Schriften, VIII, 433 S., 4 Bl. Bd. VII: Antimachiavell und Testamente, X, 291 S., 4 Bl. Mit Abbildung der Totenmaske Friedrichs. Bd. VIII: Philosophische Schriften, VII, 318 S., 2 Bl. Bd. IX: Dichtungen. Erster Teil, IX, 316 S., 2 Bl. Bd. X: Dichtungen. Zweiter Teil, VI, 285. Briefe Friedrichs des Großen. Erster Band, 319 S. Briefer. Zweiter Band, 285 S. Max Hein: Friedrich der Große. Ein Bild seines Lebens, 2. Aufl. (1916), 408 S. Einige Buchrücken geringfügig aufgehellt; Deckelbezüge partiell leicht berieben, einige Schnittkanten sowie einige (leere) Vortitelseiten leicht fleckig; Seiten sonst sauber und weitestgehend fleckenfrei (wenige einzelne Seiten mit leichter Randfleckigkeit). Gutes, harmonisches Exemplar dieser großformatigen, aufwendig gestalteten royalen Werkausgabe. Als vollständiges Ensemble mit den beiden Brief-Bänden sowie der Biographie von Hein sehr selten. 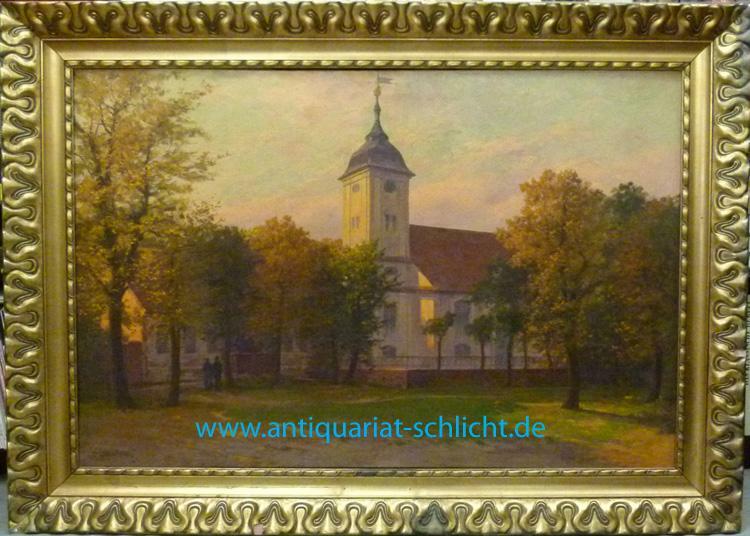 Weitere Fotos auf der Homepage des Antiquariats (bitte Art.-Nr. auf der Angebotsseite in das Suchfeld eingeben).